That’s why it’s imperative that corporate environments get a handle on their mailbox security. Read on to learn what strategies to use that will keep thieves away from your mailbox. But your average mailbox manufacturer doesn’t put too much emphasis on building sturdy security mailboxes. That’s why thieves find it so easy to pry open your everyday mailbox, and why they target them; corporate ones included. To combat this, you should invest in a security mailbox. It’s a little pricier than your run-of-the-mill mailbox, but it will save you time, money, and stolen information down the line. No matter how hard a thief might try to unlock your mailbox, security mailboxes are virtually impossible to pry open without having its proper key. For the most part, thieves like to get in and get out of a job as fast as possible. Given their angst, once a thief realizes that your mailbox is too much of a hassle to deal with, they’ll leave it alone. In the event that an intruder does make a pass at your security mailbox (we doubt this) you can reinforce your level of security by adding a mail chime. Mail chimes will alert you as soon as an intruder opens your mailbox. Plus, mail chimes are relatively cheap, costing just under $40. Place a small transmitter (mail chime) in your mailbox. 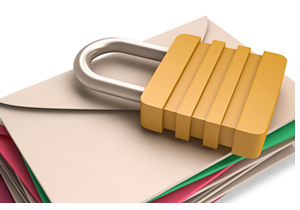 If someone unauthorized opens your mail, a receiver will alert you from your office that someone has opened your mail! This is relatively similar to the tip above, except that you’ll scare the pants off your intruder. As soon as your mailbox door is opened, a 130db alarm will ring through your thief’s ears and scare the thief away. The good thing is that the alarm can easily be heard from several hundred feet away, which can let staff know of an unauthorized opening. Think about where your mailbox is located. If your mailbox is fastened to a wall, think about some of the ways that you can increase your surveillance in that area. On the other hand, if your mailbox is a stand-alone that can be moved around, then you can move it somewhere more public, with good lighting and surveillance. Install several kiosks to reinforce the surveillance for your employees. In time, employee mailbox users will know who uses which mailbox and will be able to spot any fakers. It shouldn’t be so easy for thieves to steal your mail. Sadly, it’s one of the easiest things for them to do. To avoid this, take appropriate security measures by installing a security mailbox. Be sure to include alarm accessories as well, which will ward them off.